Fashion V Sport will trace the customization of sports fashion. LONDON.- A new exhibition at the V&A this summer, Fashion V Sport, will explore the relationship between contemporary fashion and global sportswear brands. Both industries have been inspired by street style and have been working in closer collaboration in recent years. On display will be around 60 outfits including performance sportswear, work by fashion designers such as Stella McCartney who have designed sportswear ranges, and garments such as the work of Japanese label Visvim which show the influence of sportswear on high fashion. There will also be design drawings, photographs and film to examine how these products are worn, designed, advertised and collected. incorporated the style of sportswear into catwalk fashion such as Bernard Willhelms Spring/Summer 07 patterned designs based on American bodybuilders and Jean Charles de Castelbajacs colourful reinterpretation of a jogging suit for his Autumn/Winter 01 collection. It will also illustrate how designers like Dries van Noten and Sonia Rykiel have reworked sportswear staples such as the grey jersey tracksuit into high fashion items. 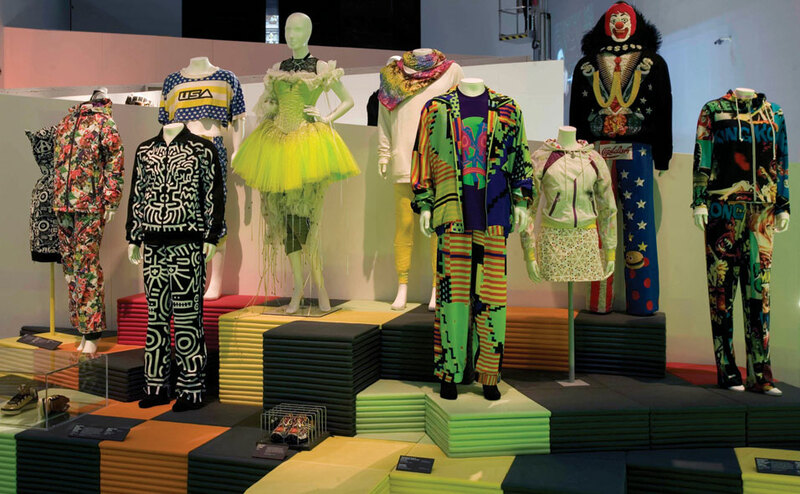 Fashion V Sport will trace the customization of sports fashion and will include work such as a jacket reconstructed from sections of Nike clothing by cult designer Dr Romanelli and Jeremy Scotts range for Adidas inspired by the work of artist Keith Haring. The exhibition will also show how the creativity of customizers such as I-Saw and Nash Money has been embraced by global superbrands, as seen in Rbk Custom trainers which allow the consumer to design their own shoe. The final section will look at the world of sportswear obsessives  from collectors who own hundreds of pairs of trainers to the Japanese fashion designer Hirofumi Kiyonaga who has created a brand named after his virtual football team Football Club Real Bristol for which he designs two fashion collections each year. It will display extraordinary products from Nikes handmade crocodile skin trainers to Ends diamond-encrusted shoelaces alongside examples of advertising campaigns for fashion brands featuring sports personalities such as David Beckham and David James modelling for Armani.